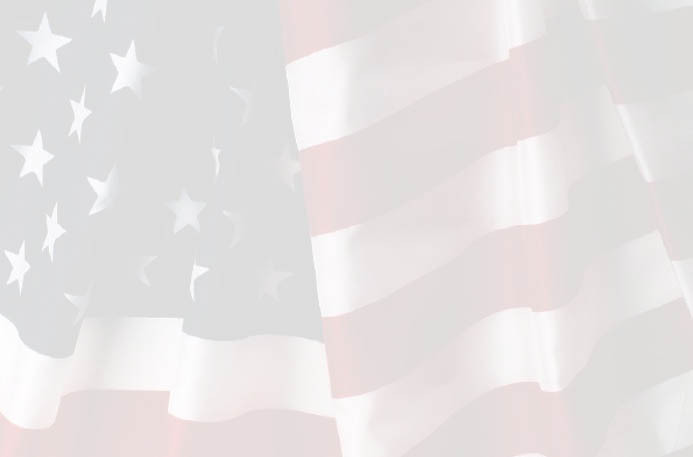 The America One & Patriot hot air balloon teams are very proud to have teamed up with the Blenko Glass Company to make a series of hand blown glass pieces that will carry America One, Patriot and Blenko names. What a wonderful concept, America One and American handmade glass. 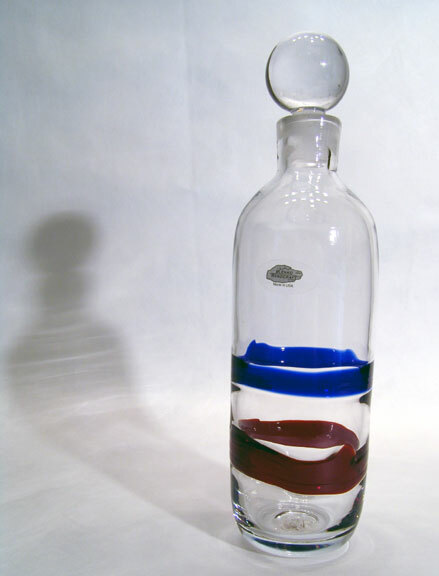 For our second year of America One glass, we are very excited to offer this extremely limited edition of 50 decanters for 2006. 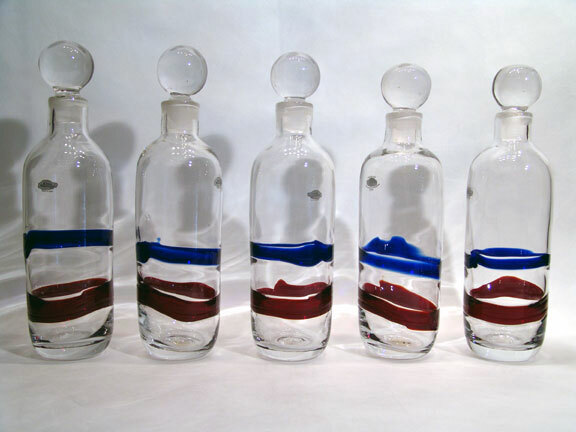 These decanters are just gorgeous and our arrangement with the company makes them very limited. Every decanter is just a little different because of the nature of handmade glass. Limited issue of 50 decanters. Each decanter is about 13" tall. With a Crystal body and stopper with Ruby & Sapphire accent bands. All decanters will be etched AM ONE S2 and each will be numbered. The Blenko Glass Company in its present form opened in 1921 and is one of the very few remaining hand blown glass factories in the United States. 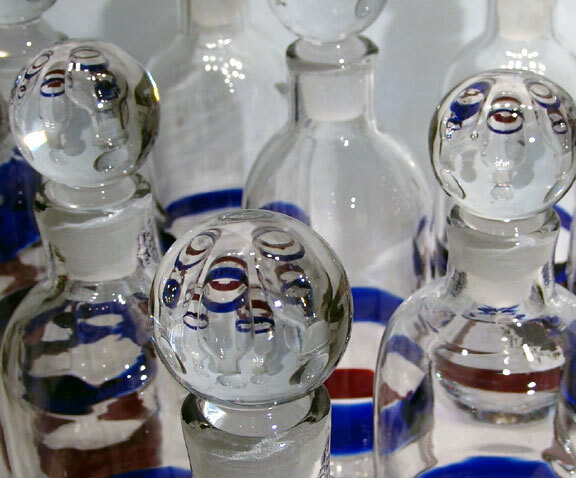 Blenko is known for incredible award winning designs in glass from many well known designers including Winslow Anderson, Wayne Husted, John Nickerson, Joel Myers & Hank Adams. Blenko also makes stained glass that graces the Washington Cathedral and the Air Force Academy Chapel in Colorado Springs, Co. Blenko was honored to make the Inaugural centerpieces for President Reagan's first term in 1981. Blenko Glass has become highly sought after for collectors and this series is sure to increase in value due to its limited availability and the Blenko Handcrafted name. Blenko Glass Company is located in the heart of Milton, West Virginia. They have a visitors center that is open daily and you can watch master glassblowers at work. Glass making video- Click here for a great video. Ever wondered what it takes to make a piece of hand blown glass? Stand in the Blenko Factory and watch how it is done. These guys make it look easy, it isn�t! For more information on Blenko Glass, click on these links. Our field trip to the Blenko Handcraft factory. Here Teri is allowed to try making a vase in the factory. Click on the above link to see how it really went.